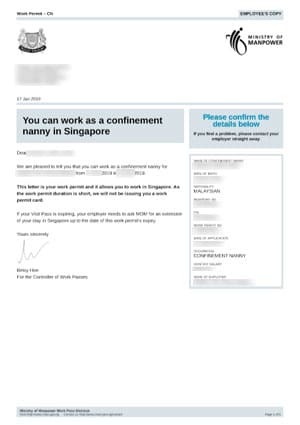 Applying Work Permit for your confinement nanny is mandatory regardless if you are engaging freelance Malaysian confinement lady by yourself or through agencies in Singapore. It is an offence for you as the employer to engage confinement lady to work in Singapore without approved work permit or pass. Ministry of Manpower (MOM) will be adjusting the application and renewal/issuance fees for confinement nanny work permit with effects from 1 April 2019. As the work permit duration is short, MOM will be issuing a letter instead of work permit card. If Visit Pass of confinement nanny is expiring, the employer have to ask MOM via isubmit for an extension of stay in Singapore up to the date of work permit’s expiry. Other passes, Employment Pass, S Pass will be adjusted as well. Please see below for the new adjusted administrative fees.